Love herbs? Me too! They grow well in containers and so you can grow them anywhere! 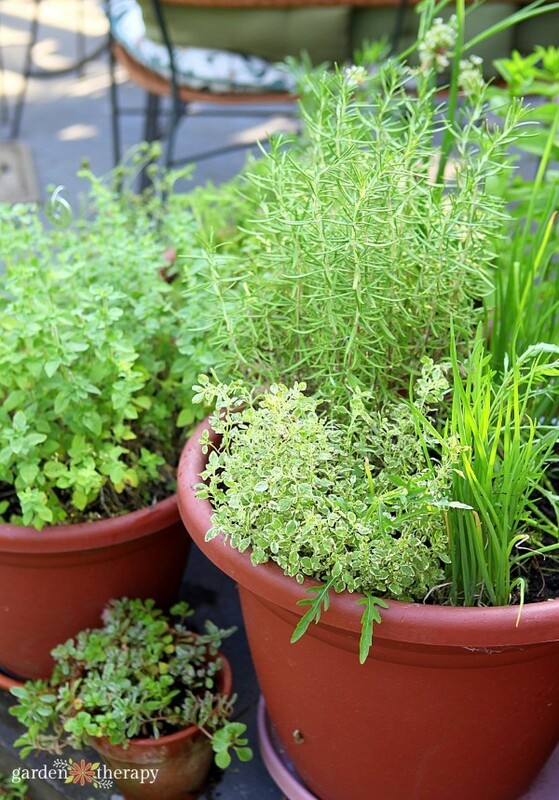 But if you want them to come back year after year, here is how to grow a perennial herb container garden using the right soil, plants, and growing conditions. 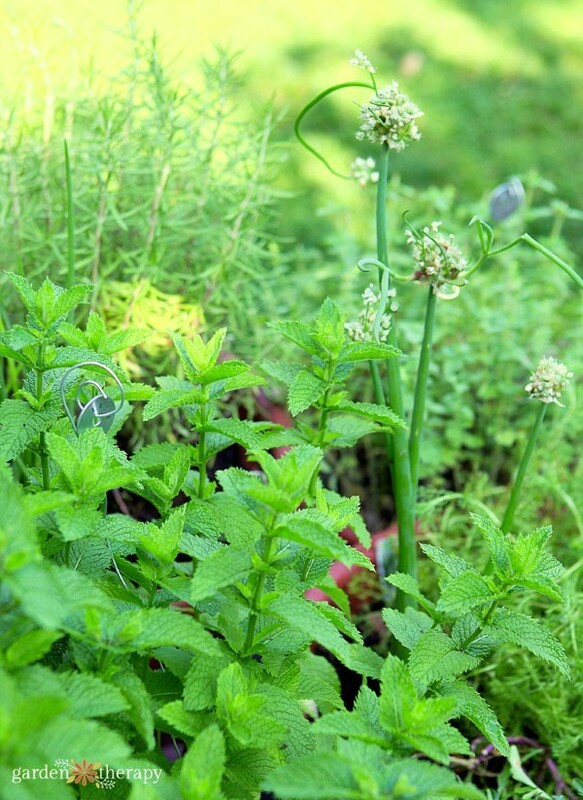 Plus, you’ll learn which herbs to plant for the best results. For years now I have been growing my garden herbs in containers just down the deck stairs from the kitchen. While a few changes are made each year, the foundation of this garden is perennial herbs. The garden will continue to produce for much of the year, allowing me winter harvests of sage, marjoram, rosemary, oregano, and sometimes arugula. 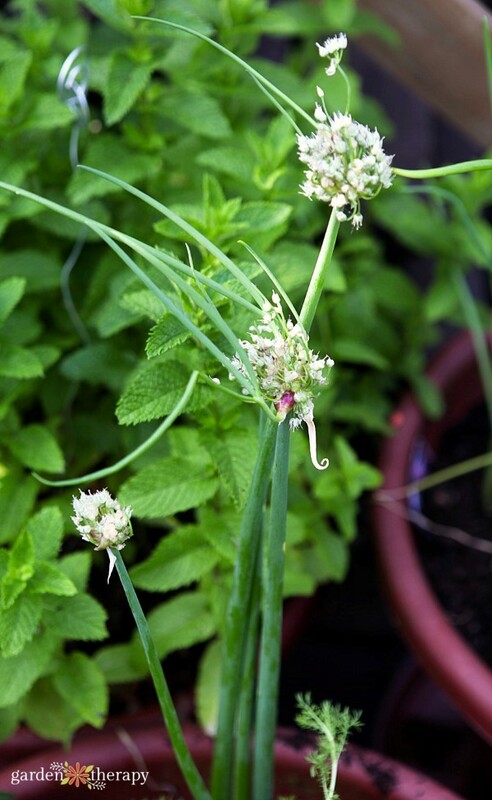 Other herbs will pop up in their due time from chives in early spring to saffron crocuses in the fall. Add in some annuals like basil, parsley, and cilantro and you have yourself everything you need for your kitchen. 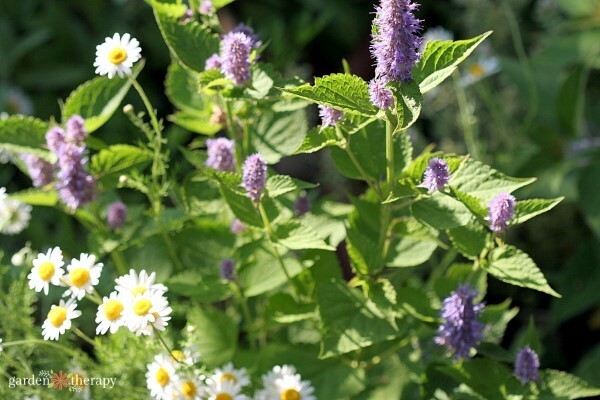 In most cases, larger is better if you plan to over-winter your herb garden. Pots that are 16”-20” in diameter will allow your herbs to grow into fairly large plants while you continue to harvest them. For over-wintering, choose plastic pots. You can dress up the area with some smaller terracotta or other decorative pots, but plastic is weather safe and will help protect the roots through the cold. 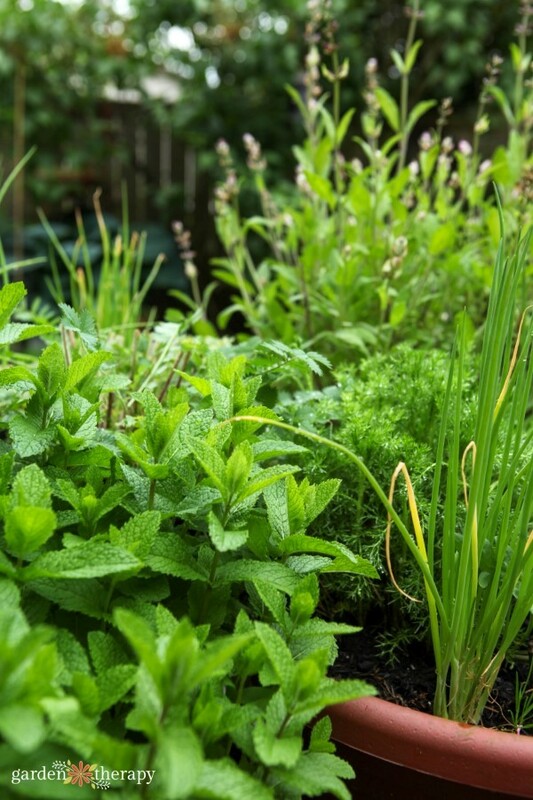 Starting with a high quality container soil gives your herb garden the best start. Each year it’s a good idea to scratch in some good compost and replace the soil completely after a few years. Regular feeding throughout the gardening season will encourage healthy growth and strong production. 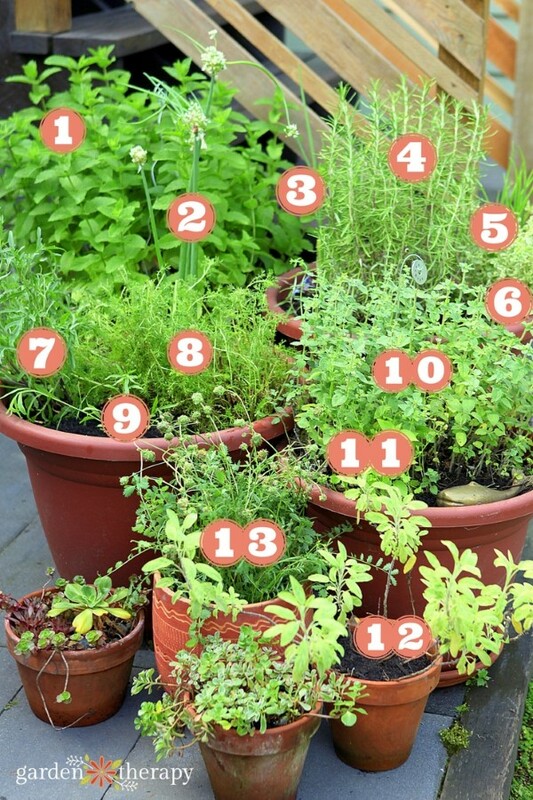 The best site for your herb garden is near the kitchen. You aren’t going to love traipsing around in the rain to find herbs at the back of your property. Knowing that your kitchen garden is close by will encourage you to snip away when your meal needs a little extra va-va-voom. Some herbs like it sunny, hot, and dry, while others prefer a cooler, shadier location. When you choose your plants think of where you are going to place your herb garden and select accordingly. There are just so many herbs out there, so the best place to start is to decide what you love and will use. Next, check out your local nursery or ask neighbors to find ideas that just may inspire a new favorite. 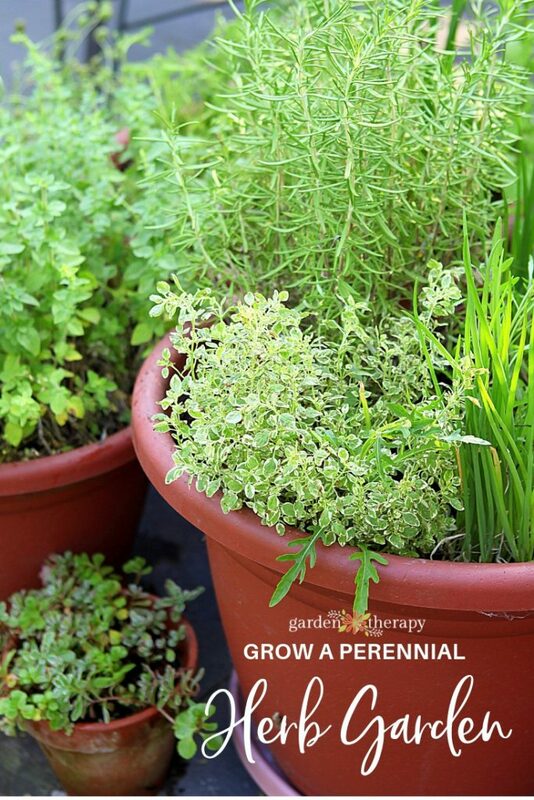 Here is some information on just a few of the perennial herbs you can grow in your garden. 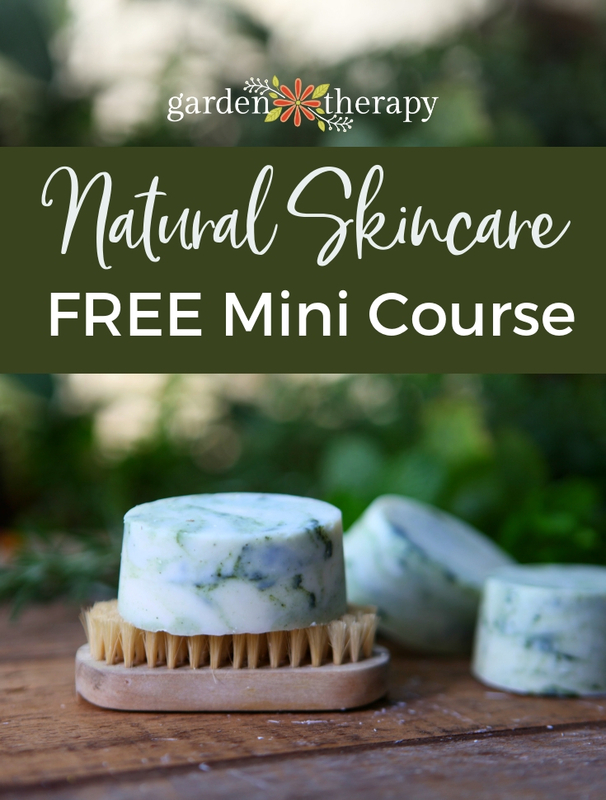 Mint, Lemon Balm & Oregano: mint is a fast-growing and spreading herb that, while wonderful for teas, cooking and cocktails, can quickly take over the garden. For this reason, mint is best grown in containers. The same is true for lemon balm and oregano. Grow these three in large containers and you’ll always have enough. Rosemary: in milder areas rosemary will overwinter but in cooler climates you should bring plants in for the cold season. Chives: are so prolific that you’d be hard pressed to find a gardener nearby who won’t give you a chunk to plant. The pretty purple flowers freeze well and will add a mild onion flavor to soups and dressings. Chive-flower vinegar, anyone? Tarragon (French): a sweeter herb with more of an anise flavor that tastes great on chicken or, again, in vinegar. Don’t be fooled by packets of seeds sold as Russian tarragon, it doesn’t stand up in flavor to the French. 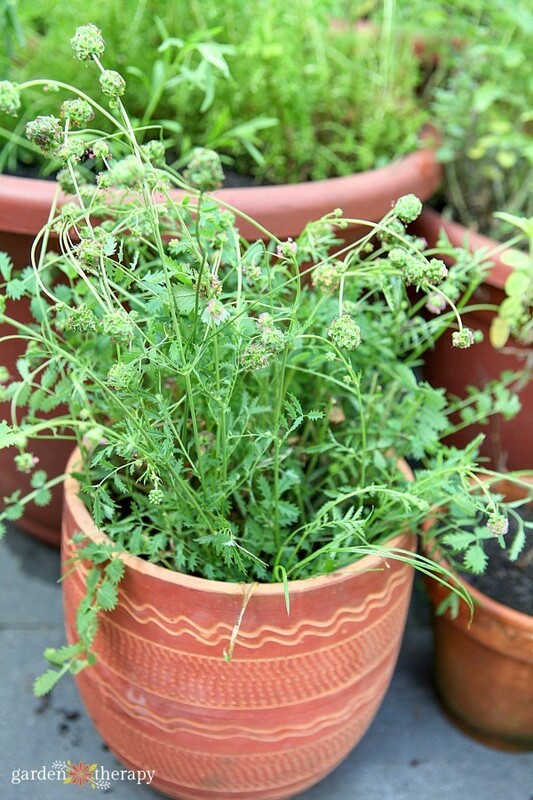 Salad Burnet: with a light cucumber flavor, salad burnet is great in (you guessed it!) salads. Leaves can be added to the bowl, or use them to make a flavored vinegar or dressing. Thyme: a wonderful culinary herb for most, but I don’t like the taste. I do love the creeping versions growing in between pavers though. Check out great cultivars like lemon thyme and woolly thyme, which are exactly what you would expect them to be from their names. Arugula: wild arugula has a peppery flavor and hardy temperament. Given enough depth for the long taproot, arugula will produce a small shrub of leafy greens to add to salads and sandwiches. Chamomile: this beautiful herb has just the most heavenly scent. Dry the flowers for a sleepy-time tea or use them in natural bath products (like this Cold-Process All-Natural Handmade Soap). Saffron: this expensive herb comes from the bright orange stigmas in the center of the saffron crocus. Pluck the stigmas off frugally, as each flower only produces three of them. This explains why saffron is so darn expensive. You may not be able to grow more than you will use in one recipe, but that’ll be one delicious paella. Bay: those large leaves used in soups and stews come from the bay laurel, which is typically trained into a large tree that is as slow growing as it is beautiful. If you have a friend with one or a spot in the garden, you will never run out of dried bay leaves as a mere few adds a lot flavor. Lavender: I can’t say enough good things about lavender. I have many plants in my garden so I can make things like Lavender Eye Pillows, Lavender Bath Salts, Gardener’s Herbal Foot Soak Recipe, Lavender Sachets, and a Dried Lavender Wreath. Now, this is only a small fraction of what can be said about growing an herb garden. 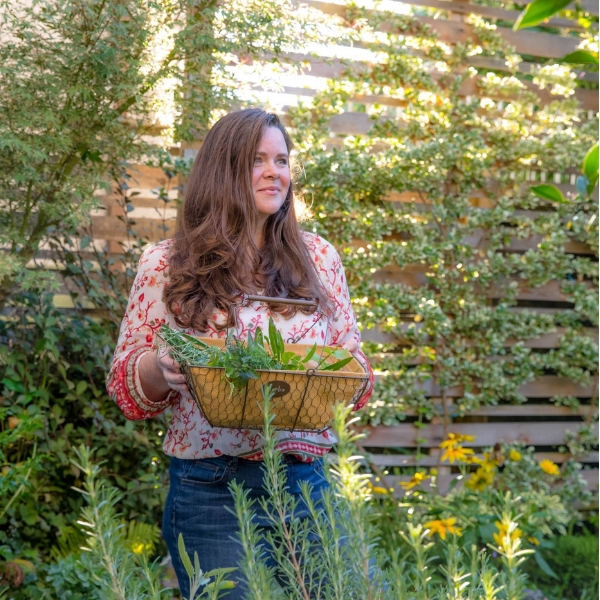 For a more extensive list of herbs plus more information on planning, growing and using herbs, check out Your Backyard Herb Garden: A Gardener’s Guide to Growing Over 50 Herbs Plus How to Use Them in Cooking, Crafts, Companion Planting and More. It’s an excellent resource for all things herbs with a detailed directory covering 52 herbs in detail and it even has some great recipes! I love this book. 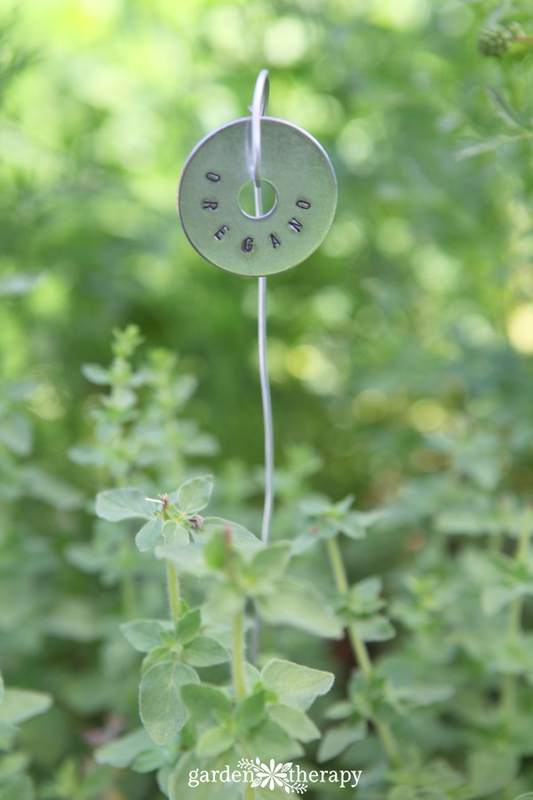 Also, be sure to check out this DIY project on making Metal-Stamped Plant Tags from Hardware Store Finds so you can label up your new herb garden. Thank you for a wonder post! I’m somewhat confused by parsley, though. I used to think of it a a perennial, because it develops a strong root. Does it not come up year after year if you keep the roots intact? Hi Tatiana, that is a great question and I was just explaining this to someone this weekend! Parsley is a biennial (2-year plant), not a perennial (multi-year plant). This means is that it grows into a the lovely leaves in the first year it is planted, then after winter’s cold temperatures, get huge, flowers, sets seeds, and dies. So you will still want to plant parsley every year to have those delicate and tasty new leaves. I hope this helps!